Climate: Climate is sharply continental with great number of sunny days. The winter is cold and humid with average temperature in January is from +5 to 0 degrees C. Summer is warm and dry. Average temperature in July reaches +45 C. Autumn is mild enough and is known for its fresh delicious fruits and price are cheap vegetables. Uzbekistan is situated in Central Asia between Amudarya and Syrdarya rivers. Landscape is extremely diverse starting from lowland Turans in the northwest up to mountain ranges of Tien Shan and Alay in southeast. Sandy deserts of Kyzylkum are located in southwest part of the republic. The territory of Uzbekistan makes up 447, 400 sq. km, equal to that of Sweden. Uzbekistan shares its borders with Kazakhstan in north and west, Kyrgyzstan and Tajikistan in east, Afghanistan and Turkmenistan in south. A smaller part of Aral Sea coasts lie on its territory as well. Government: Republic. Declared the independence in 1991. Head of State: President Islam Karimov since 1991. Head of Government: Prime Minister Shavkat Mirziyaev since December, 2003. 'Olii Majlis' is Legislative Body of Uzbekistan. 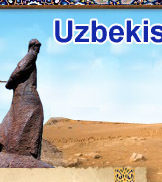 Language: Official language is Uzbek (a Turkic group of languages, like Kazakh and Kyrgyz). There is a small Russian-speaking and Tadjik-speaking minority. 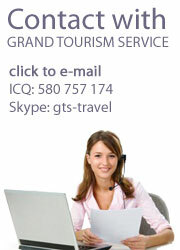 People involved in tourism speak English. The Government of Uzbekistan started to change Cyrillic script to Latin since 1991. Religion: Muslim, Sunni, Russian Orthodox and Jewish minorities. Electricity: 220 volts AC, 50Hz. Round 2-pin continental plugs are standard. Communications: Our communication services are as follows: analog and digital phone communication, international long distance, cellular phone services, paging service, internet, international express carrier service, worldwide cargo service and etc. Telephone: Country code: 998. Tashkent city code is 71. International calls from Uzbekistan can be made by dialing as follows: 8 - 10 - (state code) - (area code) - (local number). Mobile network: GSM 900/1800 MHZ, CDMA. The main operators include MTS, Beeline, Ucell, Uzmobile, Perfectum Mobile. Internet/E-mail: There are many ISP companies offering internet services. 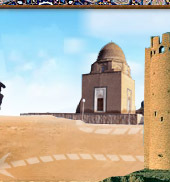 There is a number of internet cafes in cities of the Republic of Uzbekistan. Telegram: Services are available from post offices. At post offices they are pleased to render you telegram & other services. Post: If you would like to send a letter from Uzbekistan to Europe or USA that could take the addressee from 3 to 10 days to receive the letter, even sometimes a month or two could pass before addressee gets letter. Post offices (their working hours are from 09.00 a.m. till 06.00 p.m. everyday except Saturdays & Sundays and other holidays.) are pleased to render their services (prices are reasonable) and more likely it is the best way to send letters, postcards etc., however every hotel is ready to render some of the above services too. DHL, TNT, ITS, etc. are pleased to render their services too. If you would like to send a letter independently, please buy envelope & stamps then put on country name, postcode, city name, street, number of house and name of sender. Currency: Uzbek soum. Payment at Post Offices etc. have to be done in the Uzbek Soums. You should exchange foreign currency at Exchange Bureaus (there is good enough number of Exchange Bureaus in Uzbekistan at Hotels, bazaars etc. ).